You are probably here because you are in need of a good laptop that can meet all your daily needs without any stutter, but like many users you too must be wondering whether you could get an efficient laptop at a reasonable price or will you have to compromise on the quality but that’s alright because there are many laptops out there where you have to compromise on the quality but we have made sure that we don’t disappoint you for your tight budget and for this reason our team packed their bags to equip our valuable viewers with the knowledge of the best budget laptops, but before that the question arises as to what is the optimum or minimal “budget” for most people out there to make fall a laptop into a budget-laptop. 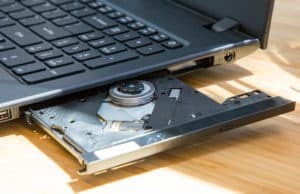 For this reason we set our team to conduct a survey and found that the ideal budget for most of the people for a reasonable laptop was under $500. Also, we found out that up to or under $500 budget for laptops has significantly met everyone’s needs, whether it’s an office worker, a student, or anyone who needs a home PC. It’s the right price to get something that will last you for a few years without needing to upgrade. The next thing was to check out the laptops under $500 and to check them out to bring out the best among them so that our viewers don’t have to wonder about much. 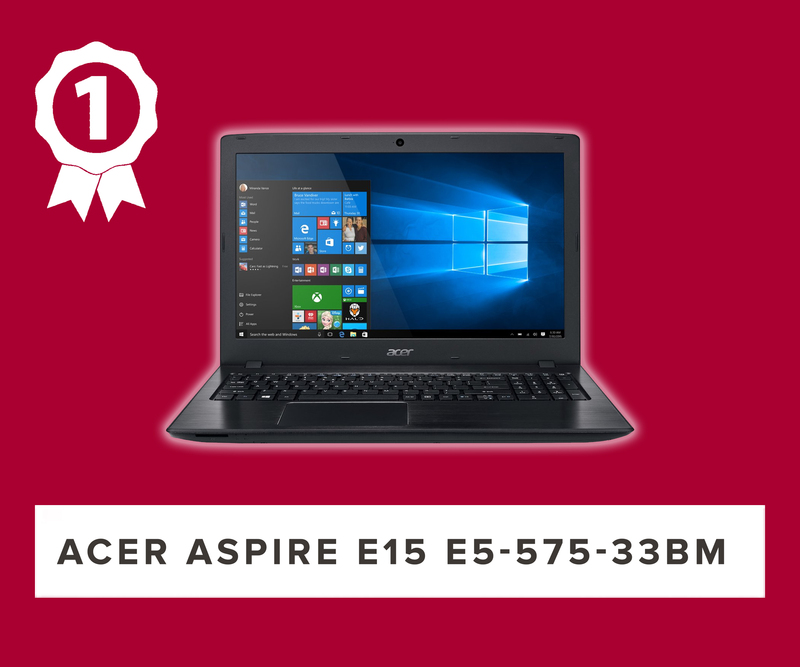 After checking out and reviewing dozens of laptops under $500 we were not surprised to have found the Acer Aspire E15 E5-575-33BM which has been maintaining its status for quite a while as the best- selling laptop on Amazon hitting the sweet spot rightly. In fact, it’s often been the top seller. 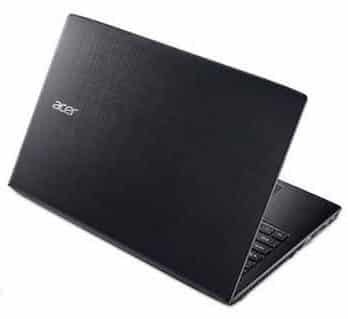 Shedding a few glimpses on the company which manufactures it, Acer, has always led the consumer market by manufacturing the best budget-laptops. They have always built a reputation for maintaining quality usually high of its price. 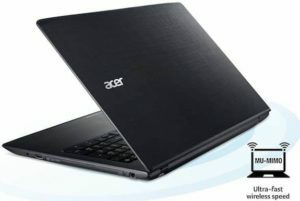 While Acer has not been a major player in the higher end market, they remain very competitive within the budget markets. This laptop seems to continue this focus on pushing what is possible on a budget product. So why let big tech companies that run multimillion dollar marketing campaigns fool you into thinking that you have to pay upwards of $1,000 to get a quality notebook when you can get the right and reasonable and efficient laptop just under $500. 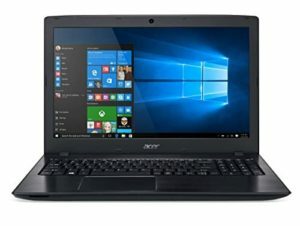 While Shopping for budget laptops is all about finding the perfect balance of the most useful features and components at the lowest price, Acer Aspire E15 E5-575-33BM has all packet in it to give you the power of modern hardware, with a decent computing experience without completely draining your wallet. 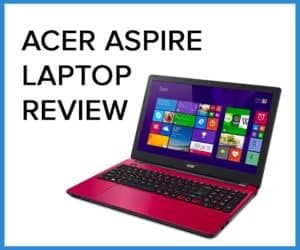 Acer has launched the Aspire E Series laptops with the aim to attract people who want lots of appealing options with an attractive design in a low budget hence the Acer E Series laptops have been always focused on providing better all-around performance. Powered by a Core i3 processor of the seventh generation (Kaby Lake), the Acer Aspire E 15 (E5-575-33BM) delivers high performance for its price of about $350. Together with a 15-inch Full HD display and respectable battery life, the computer is more than adequate for everyday tasks and multimedia consumption. Given just how much Acer’s crammed into this incredibly affordable laptop, we were curious to see how it would perform during use. So we decided to fire one up in our lab. So, let’s have a detailed look at its specifications and how we found it during work. Firstly let us shed a few glimpses over its overall design. The 1.19 by 15.02 by 10.2 inches (HWD) Acer Aspire E15 E5-575-33BM has been carefully crafted giving an overall finely finished look without unnecessary lines. It is made of sturdy black plastic with a dark grey, a matte lid that has a subtle crosshatch pattern and texture, along with a deck that looks like faux brushed aluminium. When the lid is closed, the smart undercut design on the front and rear edge give it a slim look and make it easy to open with just one hand. The fashionable cross-hairline IMR finish on notebook’s top cover gives a visual effect like metal with a soft tactile feel that makes it comfortable to hold. 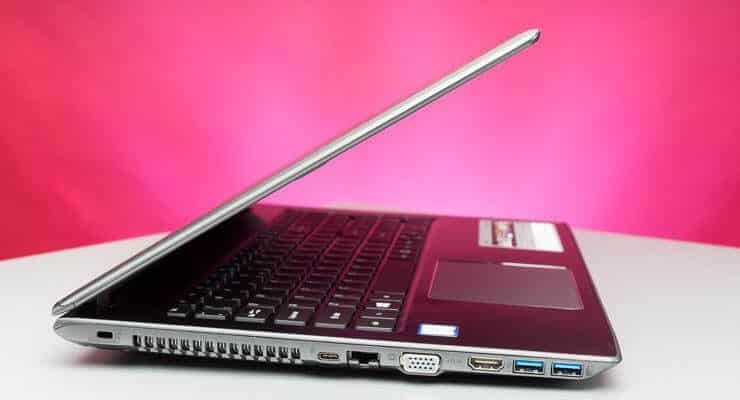 The next important thing to consider in a laptop is its weight and portability so talking about its weight, it weighs around 4.63 pounds and with a width of 1.9 inches, it’s relatively portable. Despite its bulk, the Acer Aspire E 15 E5-575-33BM manages to cut a dapper look, owing to its tapered shell and handsome brushed finish. The shell itself feels tough, while the display barely wobbles while picking the E 15 up or putting it down. The only flimsy component we noticed was the Aspire E15 E5-575-33BM’s DVD tray but you can which probably snap it off with a minimum of effort. Overall, it seems to have solid build quality, because it didn’t creak or buckle during our use and much fancy it very much fits the budget of under $500. The 15 Inch Aspire E15 E5-575-33BM boasts a resolution of 1920x 1080p with a 16:9 widescreen aspect ratio along with vibrant tones which are not usually the case with $500 budget laptops, but it does not use IPS technology. Moreover, the Aspire E15 E5-575-33BM is also capable of producing a lot of vibrant colours. According to a colourimeter, Acer Aspire E 15 is capable of reproducing an impressive 159% of the sRGB colour gamut which is much better than the 94 per cent mainstream laptop average. 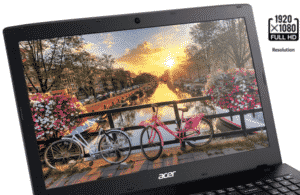 Moreover, Acer ColorBlast technology provides a 94% NTSC (more than twice as many colours as the average laptop) for superb colours that are extremely close to that of the source image. With the Acer ExaColor, Aspire E series makes every day more lively and vibrant providing exotically rich colours. Additionally, this laptop comes with an Acer Bluelight Shield feature so if you are someone who uses your laptop for several hours, you can turn on this feature which prevents blue-light emissions from the screen, reducing eye strain and preventing fatigue. Unfortunately, one of the disadvantage of this laptop is that it allows you to have less accurate, iffy and a limited number of viewing angles as it begins to dim beyond 20 degrees or so because just like other laptops it over-saturates the colours due to which you clearly see dark images from left and right side of a laptop at 45 degrees. We also found that when its raised to maximum brightness, it registers only at 216.5 nits, or candelas on our light meter well below the average of 276-nit category but we aren’t surprised by the low maximum brightness because that is alright for its price because this is quite common for budget laptops, however, we typically like an output of 250 nits so it won’t give you a satisfying experience when used outdoors as you may have trouble seeing what’s on the screen. Summing up, while an IPS display, better viewing angles and increased colour depth, would have been nice, again this is standard for the price range. After having discussed the overall design and display of this budget laptop, the next thing to consider is what it has in its hardware pack stored for us. So we will be discussing the main hardware elements in detail. First of all, the main hardware element is the Keyboard. The island- style keyboard of Acer Aspire E15 E5-575-33BM is wide and comfortable with 1.5mm of vertical travel and require 64 grams of force to actuate, hence the key travel is good but it would be ideal if the pressure would have been around 40’s or 50’s. Another important feature is that it is backlit which is rare in laptops under $500 so again makes this laptop stand out among the under $500 category budget laptops. The keys of this laptop are somewhat smaller and give a quite smooth and soft touch which often makes it mushy. Upon typing, we didn’t find quite a hurdle except for a little hurdle but you will soon get used to it. Another fascinating feature of this laptop is it dedicated numeric keypad which allows you to use a calculator and data entry into spreadsheets easier. With a dedicated numeric keypad, dedicated functions keys, and even dedicated Home, Page Up, Page Down, and End keys, the Acer Aspire E 15 surely set the mark when it comes to the sheer number of keys on its backlit keyboard. The keys themselves are a tad squishy, as one would expect from a budget laptop, but otherwise comfortable. Overall The Acer Aspire E 15 E5-575-33BM’s keyboard offers a good typing experience that’s free from any of the shallowness or flex we find on many budget laptops. The Aspire E15 E5-575-33BM comprises of a 4.2 x 3-inch buttonless touchpad that provides reasonably accurate navigation around the desktop and was perfectly adequate for navigating menus in Chrome as well as pinpointing spreadsheet cells, but its overall surface seemed a little slippery to us. While some budget laptops have very poor trackpad performance, this one is slightly better than average. Though it is not highly responsive and can be at times even noisy while clicking it does manage to get the job done, and at least is consistent. It would have been very efficient if the clicking took a less effort but I appreciated how the trackpad reliably ignored unintended palm swipes. These were just the ostensible hardware elements which are somehow similar to other laptops but what distinguishes and makes this laptop stand out among other $500 category laptops is its latest seventh generation (Kabylake) Intel Core i3 processor. Running at 2.40 GHz, this dual-core processor is on the new highly efficient 14nm technology which makes the processor extremely battery friendly for the given processor power, using an estimated 14 watts, usually half of what would be consumed by an equivalent 6th generation processor. Apart from this it is packed with a 4GB of RAM, integrated graphics for light gaming and 1TB 5,400-rpm hard drive so you probably won’t need to expand via a card unless you’re storing a large number of files. Furthermore, as it comes with a built-in DVD drive, The M-DISC READY Drive is capable of securing and saving documents, photos, videos and data for up to 1,000 years so you will never have a fear of losing your priceless memories or data. The Aspire E15 E5-575-33BM webcam is just above average for the laptops of under $500 category. While many built-in webcams cannot take good pictures, the 720p webcam of this laptop managed to take some good snapshots with vivid colours due to use of built-in lens but the image seemed to be a bit distracting and noisy at times. 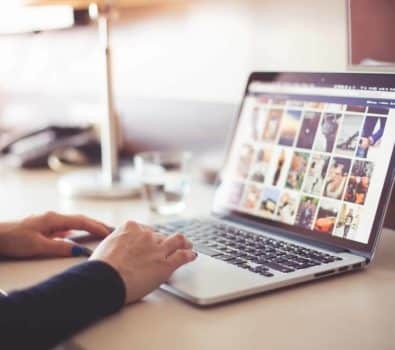 Hence for those who wish to make video calls at the workplace or those who are video bloggers we would recommend purchasing an external webcam as the built-in lens would not be enough to come up to its expectations. Also, we found that the pictures taken in indoors with bright conditions were decent enough and the colours seemed fairly accurate. Moreover, we also found that the camera is a bit fast. 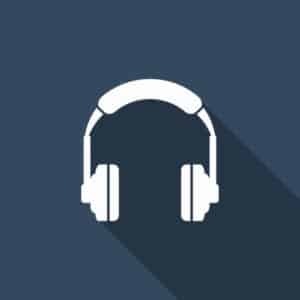 The best thing about E 15 is that it is certified for Skype for business, which means that its microphone, speakers and webcam are guaranteed to work with Microsoft’s enterprise-friendly conferencing software. Thanks to the Aspire E15 E5-575-33BM’s thick frame, as it has plenty of room for ports which is a bonus point of this laptop. The left side particularly houses plenty of ports such as an Ethernet port, two USB 3.0 connectors, HDMI-out, VGA-out and a USB Type-C 3.1 port. Likewise, the right side contains the DVD drive, a third USB port and a 3.5mm audio jack. Both the USB ports, i.e The USB 2.0 and pair of USB 3.0 connections are nicely spaced on either side reducing the clutter. The USB 3.1 Type C at the right side of the laptop is a nice touch which is compatible with many modern day devices entering the market and you won’t probably get it on most of the competing laptops nowadays. In addition to this he front lip offers an SD card slot which makes files transferring easier, so this can be a cherry on the top if you do a lot of photography and often gets the need to transfer files from your camera to your hard drive, so you can easily transfer the file without getting the need of a USB cable. Furthermore, it also allows to conveniently transferring files between machines if you don’t have a high-capacity USB external drive, or just prefer the small size of an SD card. Apart from these, for wireless connections, it is comprised of a standard 802.11ac wireless network connectivity slot that allows you to enjoy the maximum speed on any of the routers available adding to the versatility of this laptop. While we found that’s all the ports work efficiently, just that if the USB-C port or a mini-DisplayPort could work a bit faster it would have been nice. The Acer Aspire e 15 E5-575-33BM comes with Windows 10 which is surely the best combination of the Windows so far. In addition to it, it comes with a lot of utilities that aren’t harmful just that it duplicates in the built-in Windows 10 features. Moreover, it is bundled with Microsoft’s standard load of casual games and trialware, including, Sling TV, Candy Crush Soda, Royal Revolt II, March of Empires and War of Lords. Also, all the Windows 10 devices now have Battery Saver to automatically conserve power so that it can use it for an even longer period of time. Finally, the Acer Care Center checks the system health and looks for software updates timely. The most important thing to check for was its performance. As previously mentioned it comes with quite a good pack of specifications so you won’t be surprised by the performance of this laptop, With its Core i3-7100U CPU, 4GB of RAM and 1TB 5,400-rpm hard drive, the Aspire E 15 E5-575-33BM is quite more than good for multitasking. While usually, 12-14 tabs opened in a web browser and a 1080p video playing in another window a minimal hindrance or lag was experienced while shifting between the tabs. However, things got a bit slower down as I was typing in Google docs while streaming a video in one tab and downloading a large web page simultaneously. While testing the laptop for its performance it worked quite efficiently while surfing the web and almost ran all Office apps easily. In addition to this, we found that the E 15 E5-575-33BM’s 1TB hard drive copied 4.97GB of mixed-media files at a rate of 36.6 megabytes per second, which is a bit slower than the under $500 category laptops but it’s quite alright for its $350 price. Checking for its speed, The the Aspire E 15 E5-575-33BM which is equipped with the latest 802.11ac wireless featuring MU-MIMO technology, takes speed to a whole new level by giving up to 3x faster performance, when connected to an 802.11ac MU-MIMO based router, that’s makes all sorts of online gaming and streaming videos even faster and more reliable. In addition to this, as there is no dedicated memory for the GPU and it shares the memory with the main processor, so this might not be the type of laptop for a video editor. Similarly, we would not recommend running any program that requires intensive graphics and is simultaneously processor intensive because that would be out of the range of this setup. Moreover, as every electronic appliance emits heat, which is more and not properly channelized could be dangerous for the appliance, the Acer Aspire E 15 E5-575-33BM remained quite cool and silent during its use. 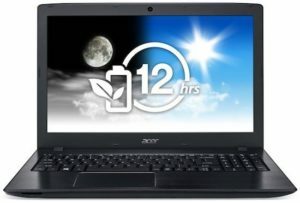 According to the standard recommended comfort threshold, , the temperature should be at 95 degrees, Acer Aspire E 15 E5-575-33BM went quite well as the temperature of the touchpad measured 78 degrees Fahrenheit after playing 15 minutes of video and the keyboard and bottom side of the laptop measured a temperature of 84 degrees and 85.5 degrees respectively. Now let’s come to the benchmark ratings and scores. First of all, worth mentioning is the Geekbench scores synthetic benchmark, the Acer Aspire E 15 has managed to score 5408 points on Geekbench 4. Next, we applied the Laptop Spreadsheet Macro Test on which the Acer Aspire E 15 took 5 minutes and 14 seconds for completing the test, where 20,000 names are being matched with their addresses. As average laptops complete the test in 4 minutes and 1 second, hence this laptop doesn’t lag behind much in the numbers. Lastly, we applied the 3DMark Ice Storm Unlimited, the Acer Aspire E 15 with an Intel HD 620 GPU managed to score 49,211 pts. 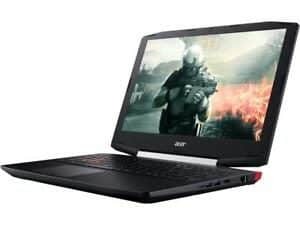 The average laptops’ score is almost 86,474 so Acer Aspire E 15 couldn’t satisfy as much as it went quite short of these numbers. On a concluding note, with its newest 7th Gen Intel Core processor, this laptop lets you work with better power, more battery life, and entertainment with a better high-quality. Well, As the specifications are already discussed above, this laptop is not for gamers. Even though the Aspire E 15 E5-575-33BM has a great processor but it lacks discrete dedicated graphics and uses Intel’s HD Graphics 620 chip which means you can’t expect any heavy 3D games to run smoothly though you can still use it for light gaming or less-demanding 2D games. Upon testing with the gaming tests such as the Heaven and Valley gaming tests at 720p and medium-quality settings, the E 15 was only able to average 18 frames per second (fps) and 21fps, respectively, which does not encounter for smooth gaming. While in HD and Ultra-quality settings, it not even reaching 5fps, so you would have to compromise for lower resolution and graphics settings. For the audio output, the Aspire E15 E5-575-33BM comprises of dual stereo speakers. The speakers are not as such that will be loved for and they leave something to be desired, as they’re adequate at best, but certainly not high quality but is okay for a $350 laptop. The speakers are loud but a bit muddy. Though you can crank the speakers all the way up without any distortion, the overall sound quality is not that satisfactory. At times they get quite loud and tinny at full volume and there’s not much bass. The drawback of the speakers is that they are located at the bottom of the case. Hence the sound is greatly affected by what surface the laptop is put on. On a soft surface, the speakers are easily muffled and made almost unusable. On hard surfaces, it can make them sound tinny and thinner than they already do. Battery life is one of a very basic and important feature while selecting the best laptop for you and Aspire E15 E5-575-33BM doesn’t disappoint us in this regard. As previously discussed this laptop comes with the latest Kaby Lake processor and a 6-cell 2800mAh Li-Ion battery pack that holds a charge for up to 12 hours and gives a better battery life and the battery gets fully charged in about 2 hours which is also a plus point. To test its battery life we had to run a few tests. On the Laptop Battery Test, the laptop lasted 8 hours and 16 minutes during continuous net surfing which is almost an hour and 20 minutes more than the category average which is 6 hours and 53 minutes. Moreover, it lasted for about 7.5 hours when we played 15 minutes 4K video over and over with its maximum brightness in Windows 10’s Movies & TV app until the battery would die which is quite impressive for a $500 category laptop. Furthermore, we had 10 hours of battery life on our standby tests. Hence, the battery life of this laptop is also a feature which makes it stand out in the competition for budget-laptops. To sum up, all features discussed in detail, the Acer Aspire E 15 E5-575-33BM is a great deal to bargain for $350. With its impressive sleek-looking design, a better battery life, a generous selection of ports, comfortable backlit keyboard and the latest Kaby Lake processor it offers a great combination of solid performance, impressive battery life and great productivity. If you are low on your pocket and need a laptop fulfilling your daily needs with much ease, then this laptop is for you. With a few upgrades over the competition, it is clearly good value for the money.